This October, I visited member Judith Jaidinger (artist and former apprentice at Zacker and Sander Engraving Companies) in Chicago with Jim Horton (Founder and President Emeritus of WEN) and Michael McGowan (University of Michigan Museum of Art). Jim and his co-author Michael have been going through and organizing the vast collection of engraving materials that Jim has amassed over the years—cataloging the prints, blocks and other materials—to piece together the untold stories of the engravers behind the big commercial engraving company names that created iconic graphic imagery for a consumer obsessed America. 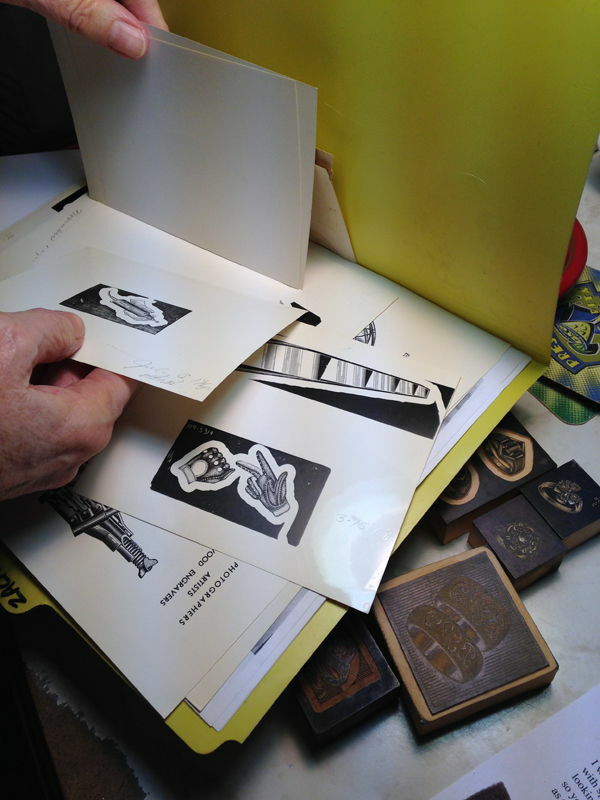 It was really interesting to hear Judy talk more about her experience working at two different commercial engraving companies and to see the photographs of a young Judy at the iron hand press and a picture of what a commercial engraving work room looked like. The engravings that came out of those industries were pretty incredible – many of the artisans never attended a formal art school, but instead kept scrapbooks with practice proofs and sketches to track their progress. The above engraving (even though it says woodcut) of the raised fist is from the Sanders Engraving Company, also of Chicago (from Jim Horton’s collection). Jim Horton (left) and Judith Jaidinger (right) in her home studio. Judith Jaidinger’s inspiring engraving table with tools from wood engravers who worked at Zacker Engraving Company – tools used by commercial engravers from the 1860s to the 1970s. Proofs from commercial blocks. The blocks are not meant for mass printing – most of these are used to make cheaper metal casts that can be sold to anyone, anywhere. 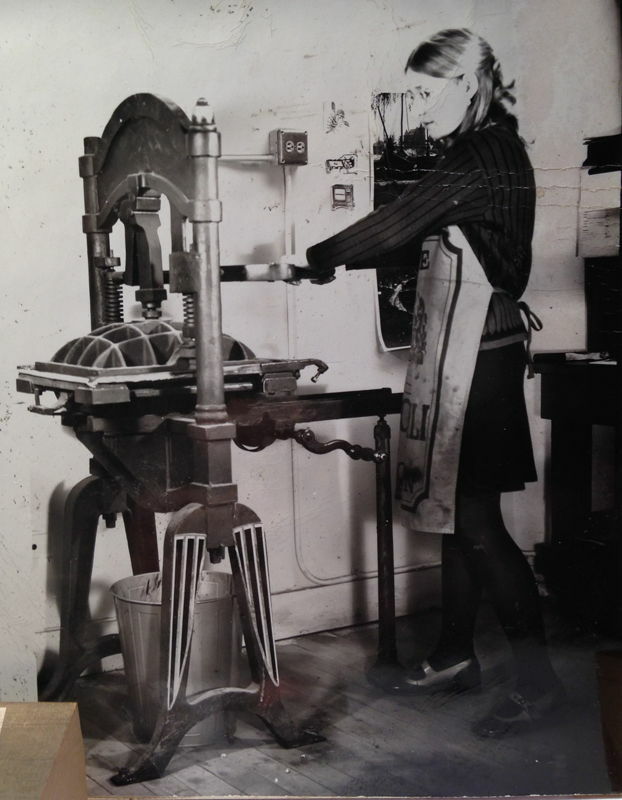 Artist Judith Jaidinger at the press in the late 1960s/early 1970s. Wood engraving done by Paul Quirk of Charles Lindbergh.